So. I did the unthinkable. Miss Frugal here actually paid to have my house cleaned. You see, it actually started when I got a gift certificate as a birthday gift from my mother-in-law for an hour and a half of cleaning. Whoa, wait a minute here, how does your mother-in-law get away with a gift like that?! Gee thanks, she must think my house is a disaster! No actually, I didn't take offense at all because number one, I despise cleaning and number two, my husband told her to do it. I was 8 months preggo at the time and really couldn't do much of anything. (Think humongous and then triple that thought). So when they called to make their appointment, I could just tell by her voice that she was awesome at what she did. No, seriously. You really could tell. First they came and went through my house with a pen and paper, writing down what I wanted them to focus on, like the 5 month old sticky spots on my kitchen floor. Then the day they came to do the actualy cleaning, wow. These ladies GO TO TOWN. Fast, professional, they know how to GET THINGS DONE. They are paid by the hour, and let me tell you, they pack more into that time allotment than.... searching my head for a good analogy here.... the socks I stuff in my sock drawer. (Lame, but I don't want burned supper so I'm typing furiously!) So lately I've just been too busy to think about cleaning. (Like busy spray painting everything in sight, searching for little boy's lost blankies, and blogging of course.) So I get a follow up call from Dana, and before I know it I'm agreeing for them to come for three hours. They moved in with vacuum cleaners, supplies, and now that they've left, I'm afraid to do anything for fear of undoing my marvelously clean house! "Pee outside, boys! I don't want to mess up the bathroom!" 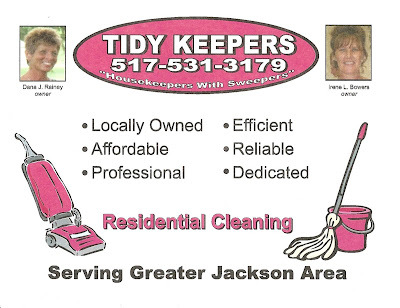 So if you're from the Parma area, you get your phone right now and give these women a call - you won't be sorry! And, I promise they didn't pay me for this little promotion. But Irene did buy three wood chairs from my barn! Woot woot! Oh and, you know they gotta be alright - I noticed a Harley Davidson sticker on the car. Always a plus when considering a cleaning lady.